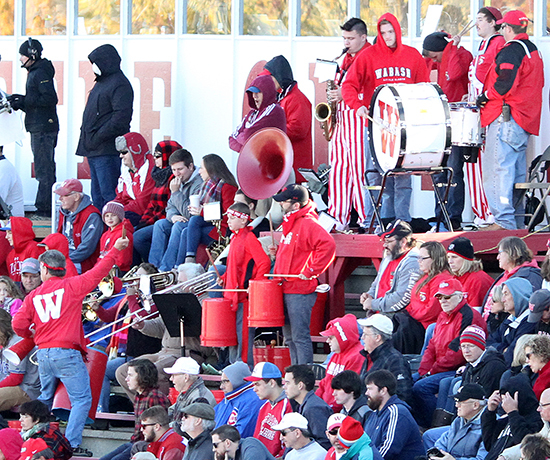 Like so many clubs, groups and traditions here at Wabash the Pep Band has appeared and disappeared over time. Sometimes dependent on a strong director, sometime it came alive because of a strong student or a motivated group of students. I thought that for this post we might look back at some pics of past bands. 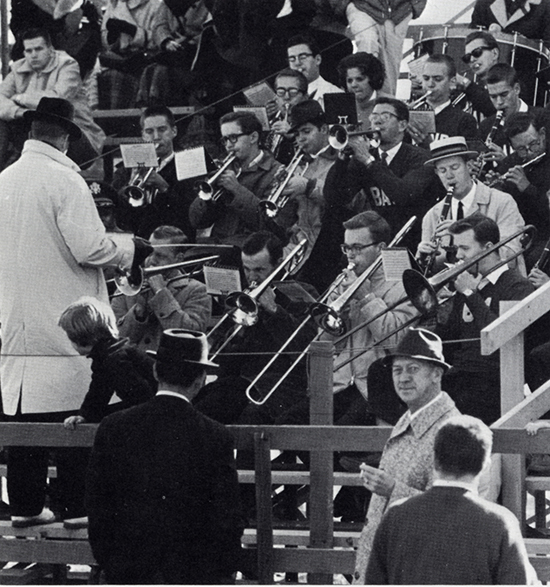 This pep band photo is from the 1963 yearbook. This band was under the leadership of Bob Mitchum. It looks like there are plenty of brass players! 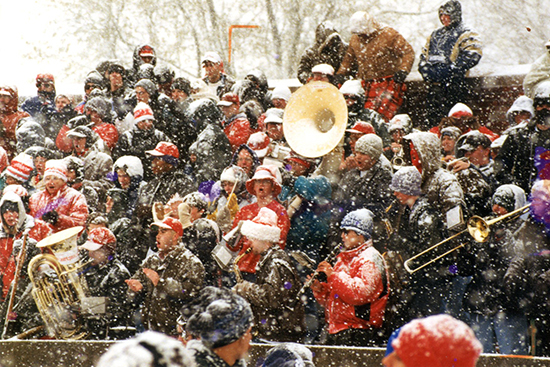 This photo is from a snowy Monon Bell game in 1997 at Greencastle. What an adventure that must have been! This looks to be an all campus pep rally. 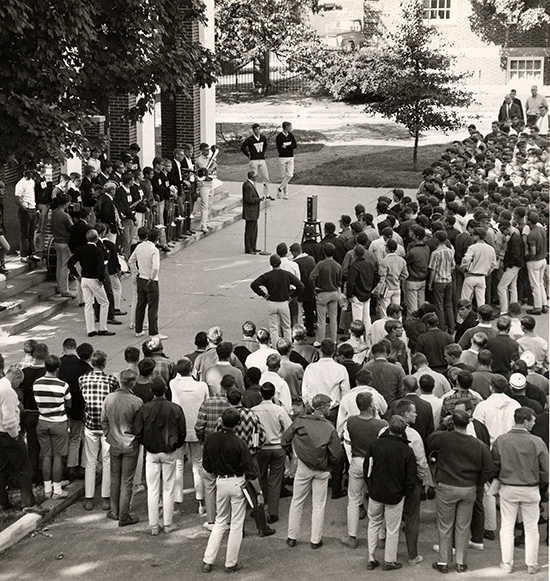 The band is on the Chapel steps and Butch Shearer is at the microphone. This short article is from the Bachelor of 1943 lamenting the loss of the band and calling for the formation of a new band, NOW! This is a colorful shot of this year’s Monon Bell game. The pep band is back and strong as ever. Now I may be a bit biased as it is my husband Jim Swift [son of former mathematics prof Dr. William Swift] who is directing the band. He is the fellow in the Wabash “W” shirt signaling to the band. And a closer look will show a fellow with a Monon Mohawk playing a sax – that is Henry Swift. At the top right is David Morgan, the head of Campus Services here and at the right middle is Dr. Jeremy Hartnett, a Wabash alumnus and professor of Classics. 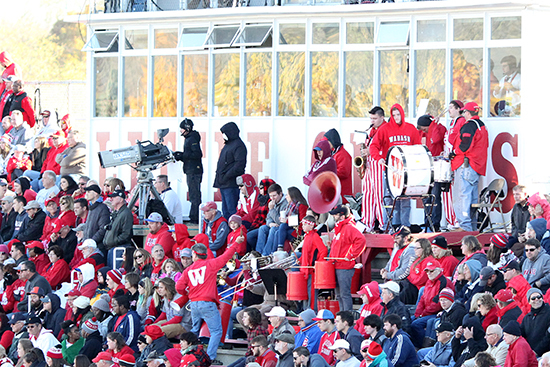 The band is a mix of students, faculty and staff and members of the local community. All together they make a powerful sound. Over the history of Wabash the pep band has been a really nice part of the traditions of Wabash. Glad to have it back, it adds a lot to the games, whether you are in the stands or a 1000 miles away and catching it over the internet.